On 18 December 2018, the Chinese authorities commemorated the fortieth anniversary of the December 1978 Third Plenum of the Eleventh Central Committee of the Party. During that momentous meeting, Party leaders formalised a decision to abandon key elements of Mao-era policies and instead focus the nation’s energies on the economy and improving the living standards of ordinary Chinese. For many it signaled a return of China to the mainstream of world history. The Third Plenum, as it is known, signaled the end to thirty years of violent class struggle and constant mass movements launched with the aim of transforming China into a socialist nation that was on the path to utopian communism. It was also part of a process initiated the previous year to overturn various aspects of Mao’s social policies. Despite the momentous significance of 1978, both then and subsequently, however, the Communist Party reaffirmed its ideological control over the society, its role as the abiding and unassailable political force in the country and the sole source of legitimacy underwriting Chinese life, aspirations and the future itself. Few observers appreciated the long-term ramifications of this much darker side of the Third Plenum. In late 2018 and early 2019, Xu Zhangrun 許章潤, a professor of law at Tsinghua University in Beijing whose work has featured prominently in China Heritage (see below), published three extended essays both as a commemoration of and a meditation on the events of December 1978. A partial translation of the last essay in that series appeared here under the title China’s Red Empire — To Be or Not To Be? 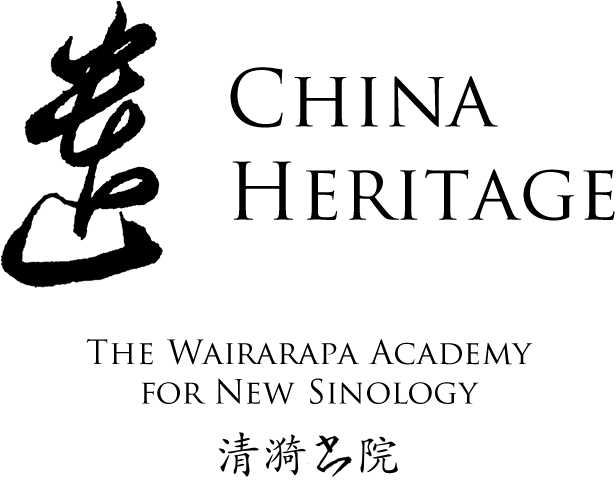 It is included in China Heritage Annual 2019, the theme of which is Translatio Imperii Sinici. The following essay is my introduction to an annotated translation of Professor Xu’s triptych. The series will appear under the title ‘After the Future in China: Xu Zhangrun’s Triptych for Today’ and together they constitute a new series of Lessons in New Sinology, as well as being a contribution to China Heritage Annual 2019: Translatio Imperii Sinici, the inheritance and reconfiguration of China’s imperial enterprise in the modern era. In order to overcome utopianism, it is not enough to be anti-utopianism or even postutopianist; one has to restore one’s love of the future, not as a promised State, but as a state of promise, as expectation without determination. The Cultural Revolution posited a new start, even a millenarian moment, for the Chinese revolution, if not indeed for world revolution. It was premised on an ill-defined strategy aimed at maintaining revolutionary momentum and ardour, it promised similar movements every seven or eight years. The Cultural Revolution unfolded in a timescape that was of the moment, one that pivoted on a radical negation of the recent past. The insistent focus on the present was driven by a preoccupation with safeguarding the future. Struggle was ever-present and the shifting status quo was perceived as being under constant threat from inimical forces, both at home and abroad. It was claimed that the malicious intent of these forces was to put history in reverse 開歷史的倒車: to prevent the steam engine of revolution 革命的火車頭 from travelling along its preordained path to the future. Such heinous attempts to derail the present and foreclose the future could only be thwarted by the revolutionary leader Mao Zedong who was both mentor and guide to the aroused revolutionary masses. Possessed of a historical perspective that allowed him to stand above the fray and perceive distant vistas 高瞻遠矚, his role was crucial and therefore his own longevity was essential for the success of the revolutionary enterprise. While he joked of one day ‘going to meet Marx’, and his supporters would tentatively speak of his demise as occurring only ‘after a hundred years’ 百年之後, nationwide he was saluted with traditional benedictions for an ‘eternal long life’ 萬壽無疆. In the early days of the Cultural Revolution, some even hoped for a scientific miracle, one that would make it possible for young people to sacrifice a year of their own lives so they could extend the leader’s life, if only by one minute. In the event, the revolutionary enterprise was coterminous with the life of its author; the Cultural Revolution is regarded as having come to an end with Mao’s death on 9 September 1976. When I went to China in 1974, time, at least politically calibrated public time, moved to a different rhythm from that to which I was accustomed. Two years earlier in Australia the Labor Party had come to power under the slogan ‘It’s time’. Among other things, the new Prime Minister Gough Whitlam’s left-leaning government had moved quickly to recognise the People’s Republic of China. For many who felt that Australia had been at a relative standstill for many decades, time suddenly seemed to be accelerating; others were of the opinion that the Antipodes were merely catching up with what had already happened elsewhere. For once, some felt, it appeared as though the nation was moving with the times, if not indeed getting ahead of them. In the China that I encountered in the late Cultural Revolution years as a foreign student, time was calculated from a number of starting points. While the formal political history of twentieth-century China began with the 1911 revolution and the new calendar of the Republic of China which marked Year 1 as 1912, there were other revolutionary points of origin signalled in the propaganda of the Chinese Communist Party in the 1970s. There was 1917, the year in which ‘the cannon volleys of the October Revolution [in Russia] brought Marxism-Leninism to China’; 1921 marked the founding of the Chinese Communist Party; the year 1949 had seen the establishment of the People’s Republic of China and the inauguration of ‘New China’; and then there was the formal launching of the Great Proletarian Cultural Revolution in 1966. Imbricated with these moments of revolutionary origin, each marking a historic beginning, there was another, more immediate, timeframe, one determined by the political movement 運動. My fellow overseas classmates and I arrived in China during the movement to denounce Lin Biao and Confucius. As I would later learn, ‘movement time’, or the schedule of the purge, marked everyone’s private life in its own particular way. But in the public realm the rhythms of the political movement, or what was referred to as ‘the latest direction in class struggle’ 階級鬥爭新動向, defined time itself. Surely, the year passed and the seasons changed in cyclical certainty, and even in its most revolutionary period the masthead of the People’s Daily still recorded the ‘seasonal temper’ 節氣 according to the ancient agricultural calendar. However, in the public realm, time was marked by political ructions aimed at the denunciation of an ever-present enemy, a constant threat, and the unforeseeable, as well as the salient, dangers of revisionism and backsliding; the existential menace of the bourgeois mindset lurked in every individual. Seize the day, seize the hour. With the end of what I think of as the ‘long decade’ of the Cultural Revolution (1964-1978: that is, from the Socialist Education Campaign to the Third Plenum) the hyperbole of revolutionary momentum that had build up during the twentieth century was put in reverse. The recent past was no longer a time of heady advancement and constant pyrrhic victories on the frontlines of production, national defence, science, education, public hygiene and culture. It was now depicted as an era of delay, even stasis. To be sure, there had been movement aplenty but it was not progress; there was activity but no change. In 1981, the party officially legislated that the whole era had been one of chaos and vacuity. The media spoke of a ‘ten-year blank’ 十年空白, as though once the previous direction of party-state policy was negated, everything that had happened in those years — national, communal and personal — was perforce null and void. Political misadventure had meant that the nation as a whole had forfeited crucial years in its effort to ‘catch up’ with the advanced industrial nations. And, for their part, many individuals who were resentful about their personal loss spoke of having been ‘born out of time’ 生不逢時 or having ‘been delayed’ 被耽誤了, forced to squander years in meaningless political infighting. In response to the popular (and, in particular, the bureaucratic) ire that many felt when contemplating this generation of ‘wasted time’, the then popular writer Shen Rong (諶容, b.1936) published a story entitled ‘Ten Years Deducted’ 減去十歲. In this comic account, a rumour starts circulating that the authorities are about to issue a directive declaring that, due to the improvident decade of the Cultural Revolution everyone has lost ten years of their lives, which are now to be reimbursed. Cadres on the verge of retirement congratulate each other and tell family members to spend up big since they are going to start life anew. A frustrated scientist sees a chance to make a real contribution to the country; while a woman with grand dreams but scant education believes she has been given an opportunity to make up for lost time. As the middle aged and elderly celebrate their temporal restitution, the young are panicked by the thought that the revivification of their elders will not only rob them of their present, but frustrate their future prospects as well. The story ends with everyone in a state of confusion as bureaucrats search frantically for an elusive directive that will put time to rights. It was an amusing fiction that people of a certain generation — and social status — could be given years in lieu of the temporal losses occasioned by the Party’s management of national life. For the Communist Party, however, the collapse of the Maoist worldview, of which the Cultural Revolution was but the ultimate expression, led to the gradual unravelling of all of the revolutionary times of twentieth-century China. Time itself, released from the hegemony of the revolutionary, has acquired for over three decades now a series of trajectories, engendering in turn a number of differently plotted time maps. Within the Chinese popular realm, some of these trajectories jostle with the official account of the temporal landscape of modern China; others, through their particular and complex contours, offer parallel, sometimes contrastive, sometimes complementary, accounts of history. These alternating or multiple times create a temporal terrain that is not merely of academic interest, but one that, I would venture, allows for personal, social and political imagination to manifest itself in ways not previously possible. The ‘communist future’ has become a thing of the past, while the feudal and bourgeois ‘past’ approaches us from the direction where we had expected to meet the future. That is to say, the particular vision of the future in countries that pursued state socialism predicated itself on eliminating the vestiges of the bourgeois (and in the case of China, feudal) past. History texts, the media, propagandists and party leaders proclaimed that the truth of communism beckoned. The world of consumerism, individual acquisition, private property as well as the legal codes, cultural habits and political protocols that went with it were accordingly relegated irredeemably to the dung-heap of history. The past was defunct, of interest only as a museum display or as a cautionary tale. The bright future of communism, however, was not only a promise, it was inevitable. With the disintegration of the Eastern Bloc and the dismemberment of the Soviet Union, this vision of the future collapsed. As Epstein observes, Russians (for they were no longer Soviets) faced a world that literally came ‘after the future’. In other words, their present as gauged from the 1990s was one in which the ineluctable future promise of communism now became a defunct anachronism. Meanwhile, the long-excoriated era of capitalism took its place as the new future. Another kind of temporal legerdemain, however, took place in China. The ‘traditional’ vision of state socialism had been ruptured, not by political collapse, but by party-sanctioned economic reform. The proffered future of perfected socialism and distant communism while an artefact of the past in former socialist countries, was only a partially discredited, or some would argue temporarily sidelined, state project in China. The vestiges of Marxist-inflected thought cloak the discourse of the official realm, even though its translation into social practice was, until the rise of Xi Jinping from late 2012 anyway, marginal at best. For all intents and purposes, the future that was the promise of socialism and party-directed revolution, while rhetorically present in the state-orchestrated ‘reality’, was effectively relegated to the past. Hence, ‘after the future’ comes a past that was decried for decades. In an age in which the country was, to use the 1980s slogan, ‘making up for the [unfinished] lessons of capitalism’ 補資本主義的課 a crude theoretical confabulation has been created. All forms of neo-liberal reform were legitimated in terms of creating ‘socialism with Chinese characteristics’ 具有中國特色社會主義. Since the country was making up for lost time its institution of state-sponsored capitalism was now cast as the ‘preliminary stage of socialism’ 社會主義初級階段. As a result of these policies, and keeping in mind the metaphor of the ‘steam engine of history’ that was common in the era of high socialism, much was now made of China ‘joining tracks’ 接軌 with every aspect of the globalised world. I have remarked elsewhere that many international commentators and analysts have approached China as if it were a story that was just waiting to happen. Until the shock of the Xi Jinping era, for them the headlines had been written, the outcome preordained. The only thing that was missing was copy from the front lines recounting the breaking media event, information that will provide some of the fine detail, add a touch of local colour here, a dab of poignancy there, not to mention a dimension of personal tragedy and a measure of bathos that makes any good story just that. China in the West doesn’t have a chance. It barely even has a present. But it does have a future, and if you restrict your media consumption to sound bytes/bites and headline one-liners, it’s the future that is the past of the Soviet Union, as well as a swathe of East European nations. It’s the future of all the defunct autocratic one-party police states that held sway during the twentieth-century. China’s tomorrow is their yesterday. Caught between the dire historical fate of European totalitarianisms and the impossible future of Chinese socialism and communism, the present itself disappears, or at best becomes a stop-gap diversion that keeps the grand narrative of history on hold. The headlines from the front line are about a story waiting to be told. For China, unlike the redundant socialist polities of the Eastern Bloc, is not only living in a time after time, or rather in a time ‘after the future’. It remains an authoritarian state ruled by a Communist Party that officially cleaves to Marxism-Leninism and Mao Zedong Thought. The panoply of state socialism — its symbols, meetings, anniversaries, diction and doublethink — remain central to the political vocabulary of the country. The prolepsis embedded in the official discourse about socialism is unchanged. The future of communism is still spoken of unabashedly, even if few would take it seriously, and the linear history plotted from the party’s founding in 1921 through social strife, war and liberation leads inexorably to the present, even if its telos is not necessarily at the end of that line. Now the communist ‘future’ and the socialist ‘present’ have become our genuine past, so that all of our history opens to us simultaneously, along with all the historical layers of twentieth-century humanity. The present may be chaotic, unstable, and unreal, but we have finally come into possession of the past, or, more precisely, it has come forward to possess us. In China, paradoxically, the communist ‘future’ and the socialist ‘present’ coexist with other pasts that offered a particular vista of historical pluralism. That vista would change radically under Xi Jinping. Although avowedly a Marxist-Leninist polity, China, like former socialist countries in the West, has witnessed many revivals over the past three decades, and in particular over the past ten years. Whole eras swallowed up in the negating maw of the state have reappeared and been celebrated in the media, the arts and in a myriad of ways by consumer culture. Moreover, throughout the country local customs and rituals, languages, behaviours and histories have been remembered, revived or re-imagined. Some of this activity has been sanctioned by the state, which openly encouraged the renaissance of regional identities from the early 1990s; much is enmeshed with the economic boom and the voracious appetite of the market; while in many cases individual or collective aspiration also plays a significant role. Of course, a similar efflorescence in nostalgic reprise has been a striking feature of life and culture in the countries that comprised the former Eastern Bloc and the Soviet Union. Furthermore, all of this can also be appreciated within the global context of national- and market-driven appropriations of everything that is retro and recondite. In China, reprisals of recent histories denied by political will are joined by the histories of eras past; collectively they clamour for a place in contemporary China, its markets and the imaginative landscapes of its peoples. Intellectuals and culture creators, social engineers and party hacks alike have been engaging in a sifting and reconsideration of Chinese history, thought and culture now for many years. As I have noted elsewhere, within contemporary intellectual debates there are inquiries that move in the direction of the past, interrogating the present as holding the possibility of a number of pasts and promising any number of futures. The bright future was detected by some as being the rubble of a past from which shards could be salvaged and used as the building blocks of something that ‘should be’, even though the promise of that ‘be’ was located in that which ‘was’. The presumed future of socialism/ communism was located in a past over which contemporary intellectuals strove to lay claim, while other seemingly possible futures, that is pasts imperfect (those pasts frustrated by the utopian history of the future promised in the 1940s and 50s by the communists), could now be imagined. Imagining what could, and can, come ‘after the future’ in China has thus led many thinkers to re-examine various paths to modernity, including those leading to other political futures, versions of bicameral democracy, social democracy and socialism that were curtailed by dynastic decline, regime change, war, revolution, political cupidity, opportunism and sheer mischance. Such efforts can perhaps be spoken of in terms of ‘reflective nostalgia’, a nostalgia among those who are ‘concerned with historical and individual time, with the irrevocability of the past and human finitude. Reflection suggests new flexibility, not the reestablishment of stasis. The focus here is not on recovery of what is perceived to be an absolute truth but on the meditation on history and the passage of time’. puts emphasis on nostos [home] and proposes to rebuild the lost home and patch up the memory gaps. [These nostalgics] do not think of themselves as nostalgic; they believe that their project is about truth. This kind of nostalgia characterises national and nationalist revivals all over the world, which engage in antimodern myth-making of history by means of a return to national symbols and myths. With its ‘peaceful rise’ in 2003, the Hu Jintao-Wen Jiabao government promoted the creation of a ‘harmonious society’ 和諧社會, one characterised by imposed social cohesion, orderly prosperity and political quiescence. In some respects this formulation recalled the ideal of the ‘great harmony’ 大同 in the Confucian canon. The Great Harmony was reformulated within the context of modern politics over a century ago by the late-Qing reformer Kang Youwei and later by that master melder of traditional tropes with Marxist-Leninist dogma, Mao Zedong, who envisaged that just such a harmonious society would exist after the work of building socialism led to the highest stage of social development. His coincidental successor, Deng Xiaoping (d.1997), saw a need to suborn such a future utopia to the needs of the present and he championed ‘stability and unity’ 安定團結 as the prerequisite for the realisation of the party’s program. Rather than ushering in a socialist ideal in some distant future, Deng’s formula aimed at creating a wealthy and strong nation — a long-cherished hope that also dated from the nineteenth century — in the here and now. Under Deng’s successor, Jiang Zemin (ruled 1989-2003), the social ideal became the realisation of a ‘relatively prosperous society’ 小康社會 xiaokang shehui. In traditional thought, xiaokang 小康 was an imagined preliminary to the great harmony. It is not only in the official political realm that utopian projects still found articulation. Intellectuals of all persuasions themselves still strive for national and social perfectibility by ‘worrying about China’, summed up in the expression 憂患意識 yōu huàn yìshì, or a ‘grandiose national anxiety mentality’. As the nation-state increasingly participated in global life through trade, diplomacy and exchanges of all kinds, Chinese thinkers and cultural activists contemplated how and when Chinese time will be in sync with, or in advance of, modernity itself. Following the rise of Xi Jinping, earlier hopes that China could transform what modernity meant itself were revived, something that Xu Zhangrun addresses at length in his three essays. Meanwhile, the party-state continues to commemorate lavishly key moments in the Party’s struggle to power, as well as the lives, and deaths, of the men and women included in the official pantheon. It is far less attentive, or positively obdurate, when it comes to the many painful anniversaries occasioned by the long decades of the Party’s disastrous misrule. Dark anniversaries such as 4 June are generally passed over in official silence, their significance marked by heightened security and house detentions. Similarly ignored are the dates of purges, mass murders and disastrous political decisions that crowd the history of the first decades of the People’s Republic, and that form a grim tapestry throughout post-Mao history. These spectral calendrical moments haunt the present, waiting to claim a place in the public memory of the nation. In the ‘opening of time’ from the 1990s until the 2010s, it was ironic that many of the socially transformative, as well as arrantly social destructive, elements of revolutionary time were elided, or banned. In 2019, this potent year of anniversaries — of the May Fourth Movement (1919), the beginning of the Nanking Decade (1929), the founding of the People’s Republic (1949), the violent suppression of the Tibetan Uprising and Peng Dehuai’s petition to Mao about the carnage of the Great Leap Forward (1959), the first celebration of the end of the Cultural Revolution (1969), the arrest of Wei Jingsheng and the announcement of the Four Basic Principles (1979), as well as the Beijing Massacre (1989) and the end of hopes on the Mainland for a ‘new authoritarian’ political transition like that seen on Taiwan, and the banning of Falungong along with the slow isolation of the sprouts of civil society (1999) — the past weighs particularly heavily on the present. It is difficult to say how the futures of the past that are presently unfolding, some openly, others covertly, in China will turn out. Despite official attempts to outlaw ‘historical nihilism’ — that is the independent study of history — the possibilities of times past and times future are well understood and, even now, covertly discussed. For all of the exhilaration of national revival, however, the power of the nation state to contain, suborn and define the present, and to maintain its purchase on the past, cannot be underestimated. Its tireless efforts also cripple the nation’s ability to imagine other futures. The Communist Party sees its main enemy in Western influences, heedless, for the moment, that China’s economic cure may well be the root-cause of her ideological disease. Party leaders have managed this malady with varying degrees of success ever since. To date, the Xi Jinping era (2012-), which now promises to extend into an unknown future, has been characterised by what could, in part, be summed up as Party version of ‘restoration’ 復辟 fùbì. Of course, the ideological mindset as well as the socio-political mechanisms have long been in place that now enable the Party under Xi to promote its older vision, one when authoritarian socialism held future promise. Those mechanisms have evolved both in tandem with the Communist Party’s own sclerotic maturation and its unremitting exploitation of the nation’s economic vitality. It has taken a man with the narrow-gauge mentality of Xi Jinping — the first Party leader to have been born after 1949 — and a hubristic confidence in his historical mission to inherit and expand on the overlapping authoritarian traditions of Mao Zedong and Deng Xiaoping. As we pointed out in our series Drop Your Pants! (published from 8 August to 1 October 2018), the leaders of China in the twenty-first century consciously draw on the lessons, and the practices, of the Yan’an era (1935-1948). Therefore, to follow China’s Pirouette of Time in 2019 it is necessary, among other things, to appreciate past visions for the future. From the moment Xi Jinping took the helm of the Communist Party in October 2012, reworking history, in particular the history of the People’s Republic, has been central to enterprise. Breaking with his predecessors, Xi soon offered up a new kind of ‘flat history’, one that reconciled the first thirty years of the People’s Republic under Mao Zedong (1949-1978) with the second three decades of Reform and Openness (1978-c.2008). It was a significant departure from the Party’s authoritative 1981 decision on post-1949 history, and it has marked an intensification of the seventy-year-long history war in the country. As long as the people have oversight of the government then government will not slacken in its efforts. When everyone takes responsibility there will be no danger that things will return to how they were even if the leader has gone. In late 2012, Xi Jinping celebrated and repeated Mao’s assertion that 週期論 zhōuqī lùn, ‘the cyclical theory [of governance in China related to the unending rise and fall of ruling houses]’ did not apply to the Communist Party. However, the restoration of one-man rule and the revival of an abrasive autocracy, demonstrates more a cycle of return than the forward march of change. Subsequently, through his actions and his backward-looking reforms, Xi also demonstrated that under him the Party lacks both democracy, as the term is generally understood, and any form of independent oversight. Meanwhile, for some three decades, the Republic of China on Taiwan has matured into a modern liberal democracy the very existence of which is a repudiation of Chinese Communist orthodoxy. In November 2017, Xi announced that the theme of the Nineteenth Party Congress was ‘Pursuing Our Original Intentions while Ever Mindful of Our Mission 不忘初心, 牢記使命. To observers hopeful that China might re-dedicate itself to market-oriented economic reforms, and perhaps even recognise the social, political and intellectual impact these had fostered, this political line was tantamount to a celebration of ossification. Indeed, to his critics, Xi is the champion of a modern-day ‘immobile empire’, one that all too readily recalls the political rigidity and ideological narrowness not only of the Mao era but even of dynastic China. For liberal analysts like Xu Zhangrun these developments indicate that China is yet to slough off the cycles of history, and it is for this reason that the history of the Qing dynasty, and its manipulation by the Communists, is important. Under Xi Jinping the socialist future of the Mao era that was relegated to the past by the launching of the 1978 era of Reform and Openness has in part been restored. The timeline to that future, one that enfolds all previous eras of the Communist Party has (for the moment) been fixed; significant milestones are laid out for 2020, 2025, 2035 and 2049. The party-state’s progress towards achieving its China Dream of wealth, power, socialist democracy and social quiescence will be measured by clocking up particular statistics and reaching targets calibrated by reams of performance indicators. Xu Zhangrun’s ‘After the Future in China’ is a bold attempt by a courageous and insightful writer to consider ways in which the past holds promise for a future free of Communist Party control. From July 2018, Xu Zhangrun’s voice has shattered the silence. It is a call for conscience and humanity, and it joins many other voices — some less voluble others more strident — heard, time and again, since the founding of the People’s Republic of China some seventy years ago. No one can dispel my profound depression. One hundred and twenty years later, a similar lament is heard among China’s men and women of conscience, as well as among all those concerned with the future of that extraordinary nation in this new age of extremes. My thanks to Gloria Davies for her comments on the original version of this essay, which was published as ‘After the Future’ in the Review supplement of The Australian Financial Review, 29 September 2006. The text has been significantly modified and updated. In the documentary film ‘The Gate of Heavenly Peace’, Boston: Long Bow Group, 1995, the writer Dai Qing recalls: ‘To me, Mao was like God. I believed that he was not only the great leader of the Chinese people, but also the great leader of people throughout the world. I feared the day when he would no longer be with us. I really hoped there’d be a scientific breakthrough that’d enable young people like us to give up voluntarily a year of our own lives, to add a minute to his. That way the world would be saved.’ From the transcript of the film, see here. A good example of a personal, Christian account of the years of purges can be found in Sang Ye’s oral history interview ‘Heaven’s Narrow Gate: Christians Who Overcame’ in his China Candid: the people on the People’s Republic, Berkeley: University of California Press, 2006, pp.212-220. For some observations on the ‘movement mentality’, see my In the Red, on contemporary Chinese culture, New York: Columbia University Press, 1999, pp.56-58. This is particularly true of Li Dazhao’s emblematic 1916 prose poem ‘Spring/Youth’ 青春. Mao Zedong 毛澤東, ‘增強黨的團結, 繼承黨的傳統 (1956年8月30日)’, in 《毛澤東選集第五卷》, Beijing: Renmin chubanshe, 1977, p.296. Mao Tsetung, ‘Reply to Comrade Kuo Mo-jo — to the tune of Man Chiang Hung (9 January 1963)’, in Mao Tsetung Poems, Peking: Foreign Languages Press, 1976, p.46. 諶容《減去十歲》, translated by Gladys Yang as ‘Ten Years Deducted’, in Shen Rong, At Middle Age, Beijing: Panda Books, 1987, pp.343-364. Mikhail N. Epstein, After the Future: Paradoxes of Postmodernism and Contemporary Russian Culture, trans. Agnesa Miller-Pogacar, Amherst: University of Massachusetts Press, 1995, p.xi. Adapted from my introductory essay ‘Between the Lines and Beyond the Text’, in Beyond the Headlines, edited by Lionel Jensen, Boulder: Rowman & Littlefield, 2000. Epstein, After the Future, pp.295-296. See, for example, Svetlana Boym’s The Future of Nostalgia, New York: Basic Books, 2001, pp.275-277, where she discusses the post-socialist histories of Moscow, St. Petersburg and Berlin. From my Time’s Arrows: Imaginative Pasts and Nostalgic Futures, in Gloria Davies, ed., Voicing Concerns, contemporary Chinese critical inquiry, Boulder: Rowman & Littlefield, 2001, pp.240-241. Boym, The Future of Nostalgia, p.49. Op.cit., p.41. Boym’s characterization of these two kinds of nostalgia builds on her earlier observations on the subject, as quoted in my In the Red, p.344. The locus classicus of Great Harmony and xiaokang is the Book of Rites. Gloria Davies gives a unique and penetrating account of this collective, if rancorous, enterprise in Worrying About China, Cambridge, Mass. : Harvard University Press, 2009. From Barmé, Silent China & Its Enemies, China Heritage, 13 July 2018, originally published under the title The True Story of Lu Xun in The New York Review of Books, 23 November 2017 (vol.64 no.18). Another voice of concern was that of a noted economist, Xiang Songzuo 向松祚, of the Renmin University’s School of Finance. For his observations on the forty years of Reform and Openness, and a series of pointed warnings and recommendations addressed to a CEO class at Renmin Business School on 16 December 2018, and immediately censored on the Mainland Internet, see here. Then, on 30 December 2018, over one hundred concerned scholars published their reflections on the anniversary. See 百餘位中國知識分子發表改革開放40週年感言.